← Fireworks used in Boston Bombings? What is special about Maltese fireworks is their huge size! This shells is probably 30 pounds and 3 feet tall. It is so large because it is actually four shells stacked on top of each other. The whole shell is loaded into a “mortar” and is fired like a cannon ball. Gunpowder is used to send the shell flying high into the air. Then precision fuses called spollettes allow each of the four shells to burst at progressively higher altitudes. This photo shows even larger “shells” with some weighing over 100 lbs! Malta is truly one of the last places on earth to see these very special fireworks devices. 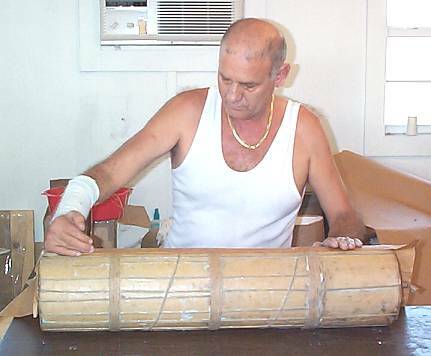 The construction of these devices is often made by groups of men and women who compete against one another as part of church groups or factories. The work is very dangerous and accidents unfortunately claim lives every year. Each year Malta hosts an international Fireworks Competition and this year the top prize went to Lieto Fireworks of Italy, followed by Mt Carmel Fireworks Factory of Żurrieq and Focs d’Artifici Europa of Spain in third. The Żurrieq company was also crowned audience favorite thanks to the public SMS voting system. 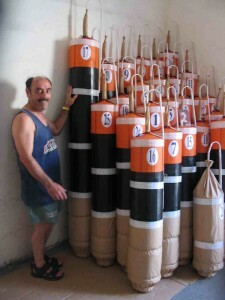 This entry was posted in Fireworks Display, Pyromusical and tagged Fireworks Display, Malta, Maltese Shells, Pyromusical, The Malta International Fireworks Festival. Bookmark the permalink.